Our team has a number of years’ experience in providing debt recovery assistance to businesses throughout England and Wales. In order to provide a transparent service, we have set out below our estimated fees for assisting your business in any business to business debt recovery claim up to £100,000 where court proceedings are required. Please note these do not apply for debts that an individual may owe your business. 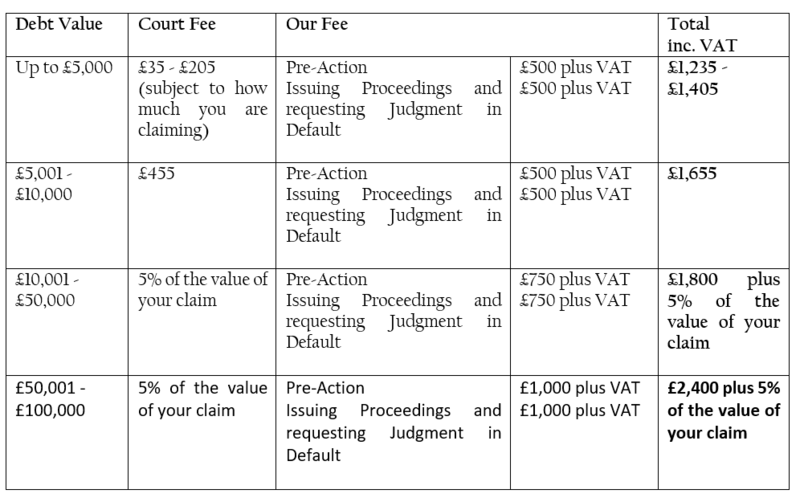 The estimated fees set out below are to provide you with some guidance as to our likely costs in assisting you in a straightforward debt claim. Should the matter become more complex than initially anticipated, or if further work is required then separate fees will be agreed. These costs will apply where your claim relates to an unpaid invoice, which is undisputed and where enforcement action is not required. Should the debtor dispute the amounts being claimed, it will be necessary to discuss what further work will be required to undertake and further advice will be given in respect of additional costs if necessary, which could be on a fixed fee, or an hourly rate if further extensive work or enforcement action is required. The VAT element of our fees cannot be reclaimed from your debtor. The costs quoted above are not for a matter where enforcement action is required to collect your debt, such as sending in bailiffs or issuing a winding-up petition; these fees will be agreed separately. Further, if the debt becomes disputed additional costs are likely to be incurred. Please see our disputes team page to see the members of our team which range from a Trainee Solicitor to Director, and details of their experience. Subject to who deals with your claim hourly rates will range from £125 plus VAT per hour to £300 plus VAT per hour. In certain circumstances, in a claim over £10,000, we may consider offering a Conditional Fee Agreement (“CFA”) or a Damages-Based Agreement (“DBA”). Before we can consider offering either of these funding arrangements, we will need to assess the viability of such a claim by carrying out a risk assessment. How long this will take will depend on the amount of documentation there is available to review. It is likely that any assessment will take between 6 – 8 hours and will usually cost between £750 – £1500 plus VAT depending on which fee earner undertakes this assessment. Where a CFA or DBA is offered, you will remain responsible for all disbursements including court fees, Barrister fees and search fees. If you are successful in your claim, any success fee will also be payable by you; this will either be a percentage of the costs incurred or a percentage of your damages subject to which funding arrangement is offered. Taking your instructions and reviewing the necessary documentation to advise you on your claim. Undertaking appropriate searches of the debtor. Receiving payment and sending on to you, or if the debt is not paid, drafting and issuing the claim at court (the relevant court fee above will be payable prior to issuing the claim). Where no Acknowledgment of Service or Defence is received from the Debtor, applying to the court to obtain Judgment in Default. When the judgment is received, writing to the debtor to request payment again. If payment is not received within 14 days, providing you with advice on the next steps of taking enforcement action and the likely costs. How long will it take to receive payment? This is a difficult question to answer, as much is dependent on how responsive the debtor is to our formal request for payment, whether court proceedings are issued and whether enforcement action is needed to recover monies owing on obtaining a Judgment. In most cases, it usually takes between 4 – 12 weeks from receipt of instructions to receipt of payment from the debtor; although this can take longer is court proceedings are issued whereby much will be dependent on the court’s availability and timeframe for issuing proceedings. As indicated above, if the debtor tries to avoid paying the debt, and enforcement action is taken matters will take longer to resolve.